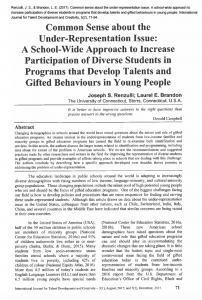 Joe S. Renzulli and Laurel Brandon, of the University of Connecticut have completed a comprehensive examination of issues surrounding the underrepresentation of diverse students in programs for the gifted. The article has important implications for serving underachieving, at risk and ELL students. The article will be especially valuable to administrators and policy makers who are struggling with this important challenge in gifted education. Renzulli, J. S. & Brandon, L. E. (2017). Common sense about the under-representation issue: A school-wide approach to increase participation of diverse students in programs that develop talents and gifted behaviors in young people. International Journal For Talent Development and Creativity, 5(2), 71 – 94. Serving the needs of underrepresented students was one of the primary reasons Renzulli Learning was developed.